Have you long dreamed about getting married on a tropical beach or at a countryside villa in Tuscany? 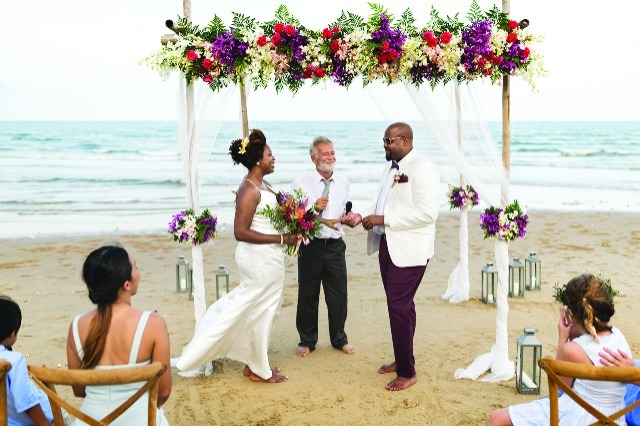 Wherever you decide to tie the knot, here are a few things to consider when planning your destination wedding. Weddings require extensive planning and if yours is out of town, the details can become overwhelming. Hire someone local to the destination—or someone from home with experience coordinating events in your chosen location—to avoid unnecessary headaches. Be sure to show your guests you appreciate them traveling to be with you on your big day by organizing a few group activities for them, either before or after the wedding. You can plan a welcome breakfast, for example, or an excursion to take in the local sights. Don’t be surprised if some of your loved ones can’t make it to your wedding. While it may not be a problem for all of your guests, it’s important to understand that a jaunt to Europe, a week-long all-inclusive trip to the tropics or even a weekend in the next town over isn’t in everyone’s budget. In addition to the above, think about how you’ll transport wedding essentials to the destination. If you’re traveling by plane, it’s best to pack wedding attire, rings and gifts in your carry-on bag. Think about throwing a party when you get back home. This way, you’ll still be able to celebrate with the people who weren’t able to make it to your destination wedding.